Michele Quondam is one of my favourite designers of the last years. His games are not simple, often rather complex, and always with deep strategical elements. It usually takes some time to get along with his games, but to my mind it is worth familiarizing with the rules and mechanics. The story of the game is a well known one: somewhere in the world, a military research project got beyond control, and a deathly virus spreads out, which turns people into zombies and monsters. There is only one chance for us: we have to get into that damn laboratory, find the patient zero, and return with him to a team of scientists, which can develop an antidote by closer studying the patient zero. Unfortunately we are running out of time. Only a short period of nine rounds remain for us to prevent the final outbreak. And of course, meanwhile all humans in this military laboratory have already turned to zombies, who definitely know how to prevent us from getting the antidote. A game of Virus begins with only a small part of the laboratory already visible to the players. 148 room cards are waiting for us to build up the laboratory. All players start at the one edge of the laboratory at the entrance with three other room tiles adjacent to it. All other rooms are build up by the players during the game by taking new rooms from individual player rooms displays, each consisting of eight or more rooms in a turn. So building up the laboratory is not completely random like in other real-time games like Escape by QUEEN GAMES, but still it is not predictable how the laboratory unfolds at the beginning of the game. We only know one small, but important detail about the laboratory: the positions of the two exit control rooms, indicated by a randomly drawn card. Depending on the still living heroes one or both of these rooms must be reached simultaneously to reopen the door at the entrance. This door snapped shut after we stepped inside the doom place and can only be reopened by activating this mechanism. So at the beginning we only place the two rooms roughly to the indicated position. During the game you should check this position from time to time, because in the hustle and bustle of the real-time phases, the small room tiles – which are placed on the table without a board – tend to shift easily. The next phase can be called the heart of the game, and is already difficult enough, even without the events. It is the real time phase, in which players can do most of their actions. First of all, it is possible to move a hero from one room to another by spending action cubes. Whenever a hero moves to an unexplored space, the player takes one of the rooms from his own playing area and adds it to the laboratory. But during this phase the heroes can also search the rooms for finding resources, which again are used to buy tokens in the following phase. There are 11 different tokens that can be used for various game purposes. For example, barriers can be used to bar open doorways during the real-time phase. This prevents monsters to pass by (at least if the monster group is not too strong to break the barrier). Breaches can be used to break in walls. On the other hand we can can also simply open the doors, and close them again (which is quite useful as it prevents monster groups seeing us. So they hopefully do not move in our direction). You can even place explosives that will bring down a whole group of monsters at the moment they enter the room. Finally, you can activate special rooms, an exit control rooms, a first aid room, a net and an ammo room to trigger associated actions. All this happens in this real-time phase and simultaneously by all players. There is not always enough time to make arrangements, and so a room, e.g. with an exit to the right, might be placed by another player, although you just wanted to move your hero to the left side. But there is still another task for us in this phase. And this is the only chance to get rid of our nasty enemies. But remember: it is still the real-time phase, so we must be quick to finish them. And this is how it works: each player has a small combat board with 16 separated, small hit areas. Whenever a heroes is in the same room or sees a monster group, he may attack it. For this, he takes a number of action and bullet cubes from his stock and „rolls“ them on the player board. Each cube that touches a hit area counts as a success, all other cubes are removed and are lost for the player. The number of hits is the product of positive bullet and positive action cubes. Other resources can be added to the roll to benefit from their special powers, like a multiplier, a dodger or others. And for each three successes a hero deals 1 damage, enough to kill the minor enemies. Leaders, bosses and trickers are stronger enemies and suffer wounds. After each combat round, the remaining zombies perform a counter-attack that automatically causes damage to the heroes. So instead of using normal dice, Michele Quondam has designed an interesting new mechanic to kill your opponents. On the one hand this is great and I personally liked it a lot. But I also found it difficult to explain to other players, who already had problems hitting the board with the cubes, never mind striking the hit areas. It turned out to be confusing to calculate the hits, and then it took even more time to divide those hits between the enemies. As the calculations and evaluations take place during the real-time phase, simultaneously by all players, I dread to think how many mistakes happened. So, as you can see, there is indeed a lot to discover in the real-time phase. This is not only a time full of activity, it is pure adrenalin. No time to think about what you are doing, because this phase – depending on the difficult level and the number of players – lasts only 35-60 seconds!!! Quite a mess, indeed. I saw players totally overwhelmed, performing only one single move during their first round. So I strongly recommend to start the game with a variant that ignore the countdown. So players can help each other to get familiar with all of the options and mechanics of the game. However, in the normal game a breathing pause after this frantic phase is doing good. And so let us have a closer look at the slow phase of the game: The first action is not too good for us, because all monsters that are involved in a combat make one final attack. 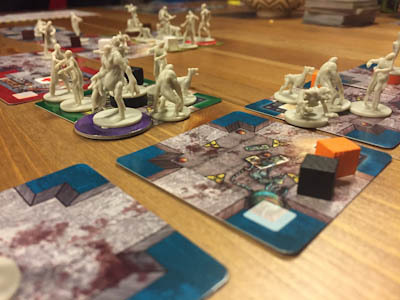 Hopefully that did not kill your hero, because after that, the survivor could be faced with new horror: comparable to the zombie movement of Zombicide, all monsters are drawn towards the heroes. 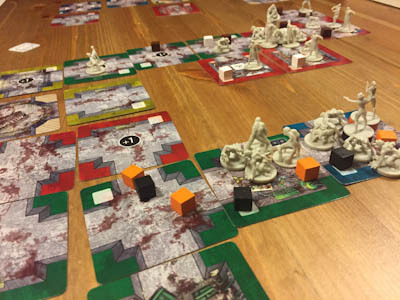 Either they see or hear you (both we already know from Zombicide), and they even sniff you in this game, making monster movement more variable and more difficult to foresee in the frantic real-time phase. And finally, new creatures enter the laboratory, not at given spawn points, far away from the players, but close to the heroes, influenced by the actions the players have performed in the phase before. Basically each room with an action cube, which has been spent for moving or searching, contributes to the number of new creatures. Players may freely chose which creatures to take from the reserve. For each of four creatures, a stronger leader is placed. So the laboratory soon turns into a dungeon, if players are not skilfully enough to prevent it. Last but not least it is time to spend resources that we collected in the round. Next to bullets, there are some cool tokens and cubes to buy in this phase like explosives and shields for the fightings. Also players can equip themselves with the barriers and doors in this phase. Adrenaline, heart and four-leaf tokens complete the picture of the many options you have. 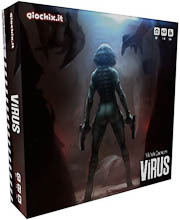 Maybe Virus could best be explained as a mixture between Zombicide and Escape. All that combined with the typical complexity and extensive use of symbols, we know from other games by GIOCHIX.IT. The real-time phase is really frantic. It is extremely important to know your options, because even 60 seconds is a very short time for all the different actions. The combat alone takes a good while of your precious time, so it is often better to prevent it and to isolate enemy groups by building up barriers and closing doors. But you always should remember that you have to return to the entrance at the end of the game. Building up alternative routes to avoid the monsters during your way back is one of the options you should have in mind when building up the laboratory. I think that Virus is a killer game for most occasional gamer. It is extremely difficult to master and much more complex than it seems to be. If you are playing the regular variant, it is essentially to perfectly plan your moves ahead. But that is not enough, I think you also should to be favoured by fortune while „rolling“ your dice. Of course Virus is not meant to be mastered in your first game. But I had to learn that some of my fellow players really got frustrated by the nastiness of some of the game rounds. I may be wrong, but once again I strongly recommend not start the game with the regular variant. And you definitely should not start with the spy mode, in which one player takes the role of a spy. I once made the mistake to introduce a new group of players with the boss variant. In this varaint you can play the game with 5-6 players, with 1-2 players controling the enemies. 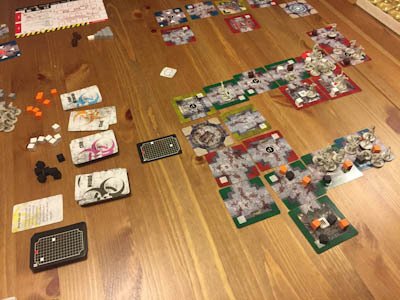 These players ignore the normal movement rules for the creatures (seeing, hearing, sniffing), but determine where the zombie groups move. This makes the game even more difficult for the heroes. 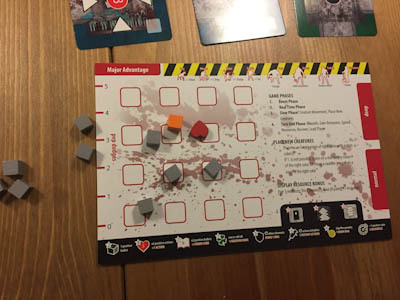 In the end, if you and your playing group are earnestly willing to learn the game, you will be rewarded by a medium-weighted, frantic zombie game with some interesting decisions to be made.